"P2P program based in LimeWire to download music, videos, games and more"
Are you looking for a place to download all type of files? Find music, games, videos, TV shows and more than twelve millions of media files shared over the wide LimeWire network, all from a program called MP3 Rocket. This program is a LimeWire client based in a very particular version that brings all basic LimeWire features with variants which as soon as discovered will attract many people. 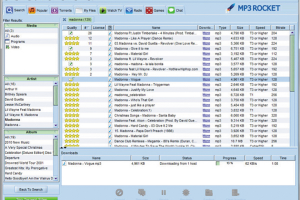 As MP3 Rocket is based in LimeWire, its interface is one of the best organized existing interfaces by offering a totally efficient control over the search engine, all thanks to the use of content filters. In fact, MP3 Rocket will keep you up to date with the latest releases from its “What´s New” option, allowing you to access recently files uploaded to the network. That´s not it, this P2P LimeWire client lets you download torrents and offers several radio stations.